Intel has always done a really solid job of promoting their brand and products. Intel is also a company that is heavily invested in digital convergence marketing tools, tying physical and digital spaces together quite well. One of their latest campaigns is “Push” an old school arcade game tied to a social media campaign, attached to a game where the grand prize is a new Ultrabook. It’s a fairly simple concept. You connect with Facebook or Twitter and get in line. When your turn comes up, your name in 3D block letters is pulled by a robotic arm and placed on the table. Then those letters are pushed forward in the stack. If your name is the one to push it off stage, you win. The game plays out in real-time, streamed to the web. Posted in Advertising, Social Gaming, Technology and tagged Digital Convergence Campaign, Facebook, Integrated marketing, Intel, Laptop, PUSH, Robots, Social Gaming, Twitter, Ultrabook on May 6, 2013 by Author. The Museum of Me. Intel Archives Your Facebook Life. One thing that seems to be really hot right now, and very reflective of the changing landscape with social networking sites, is the ability to archive what you have posted. There are a number of applications like Memento that do a pretty good job, but none that have really hit a home run for me as of yet. To promote their new Core i5 processor, Intel has developed the “Museum of Me“, a website dedicated to archiving all your Facebook information in a 3 minute long video that showcases your info, posts, images, friends, locations, and other Facebook ephemera. The result is a fantastic personal exhibit set to a soft smooth soundtrack. What a great way for Intel to promote their Core i5 processors, and link to the most popular social networking site in the world. Posted in Advertising, Media and Mediums, Motion Graphics, Postaday 2011, Social Networking, Technology, Video and Motion Graphics and tagged Core i%, Facebook, Intel, Momento, Museum of Me, postaday 2011, postaday2011, Social Media, Social Media Archive, Social Networking on June 1, 2011 by Author. “The Chase” was created by San Francisco agency Venables Bell & Partners and directed by Smith & Foulkes, the same guys that did “Honda’s Grrr”. It’s a visual illustration of the incredible multi-tasking power of the new Core i5 processors. Smith & Foulkes staged a 105-second chase across a wide variety of application windows on a computer desktop including iTunes, Facebook, YouTube, Microsoft Office and the Adobe Creative Suite. It’s a really nice combination of live action video, animation, and post production/motion graphic techniques. 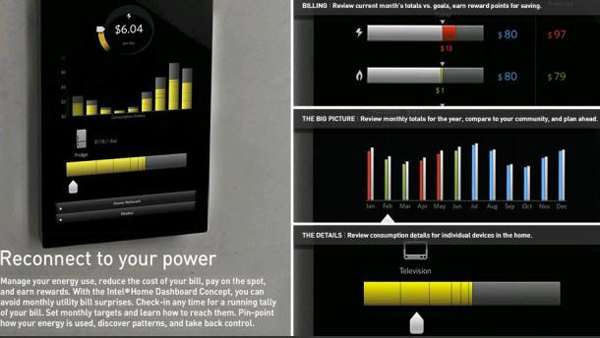 Every Modern House Needs a Energy Monitor. At CES this year there were a couple of product announcements that were overshadowed by the plethora of Netbooks, tablet PC’s and other shiny electronic ephemera that flooded the trade show floor. One thing that really caught my eye though were two products. A proof of concept from Intel, and SilverPAC’s SAT 7 thermostat. Since Intel’s product is just a proof of concept, I really want to talk about it possibilities and the gorgeous design behind it. SilverPAC’s though will be available this fall and I am seriously thinking about getting this for my house. 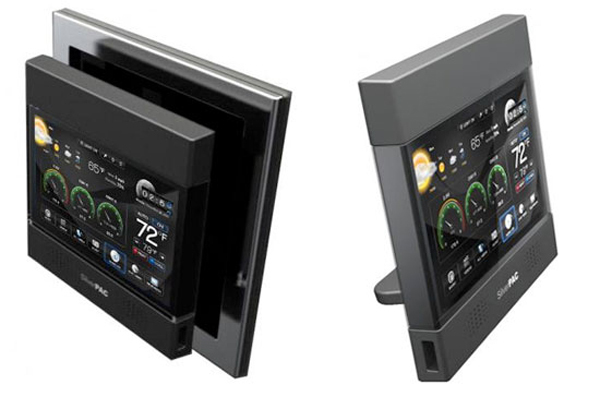 Intel 3 weeks ago launched a Web site dedicated to its Home Dashboard Concept, a touch-screen display designed to help home owners control and reduce energy use. Home Dashboard is an Atom-based device that will let people record video messages to other family members and, through third-party applications, let people look up information on online yellow pages or track packages over the Internet. 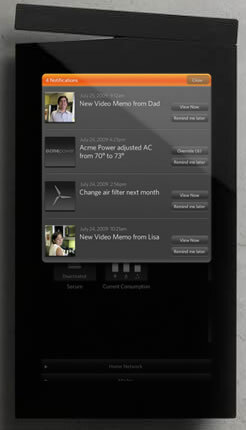 More over the Intelligent Home Energy Management Proof of Concept is an 11-inch touch screen that functions like a remote control for home energy. The switch at top lets people turn a home to ‘away’ mode, automatically adjusting security, thermostats, and cutting off stand-by power. 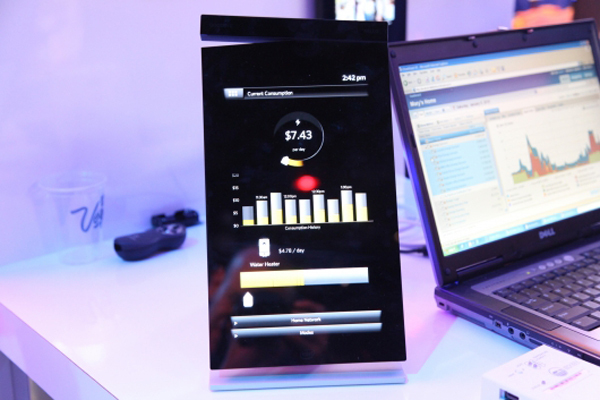 Intel’s home energy dashboard is a more sophisticated version of existing whole-home monitoring products, such as TED. But Intel’s approach suggests one route for getting the energy data promised by the smart grid without having to wait for smart meters to be installed and fully activated. Because the dashboard device is a Wi-Fi hub, it can get recommendations on how to reduce energy use from the Internet, according to the Intel demo. People click a switch to turn the house to ‘away’ mode, turning all stand-by power off and adjusting the thermostat. And the whole thing looks gorgeous. Sleek black case, and based on the images, a clean easy to use UI. 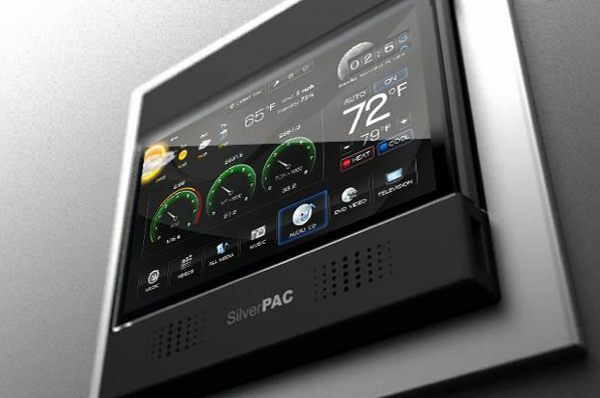 The SilverPAC SilverSTAT 7 is a $600.00 device that does what the Intel Home Dashboard wants to do. I say this because, SilverPAC is guaranteeing that this device will be available this fall, and with Intel you never know. The device is elegantly designed 7 inch touch screen display that illustrates the distribution of household energy down to individual appliances. With its IEEE 802.15.4 wireless interface, the SilverSTAT 7 will speak directly to the new “smart meters” that will have the ability to send information on real-time electricity and gas use in households directly to the utility companies. In addition it lets you monitor your home usage from remote locations, fine tuning power usage for your home even when you are not there. I love this idea because it will allow me to build the most efficient power set up in my home, and eventually I end up saving money with this. By feeding information directly to the utility companies, it allows them to build a smart power grid that helps them tune power consumption to the community, making for a more efficient set up for all of us. Intel specs break down as follows: a gorgeous 11.5-inch capacitive OLED touch screen, Z530 processor, motion sensor and video camera support, stereo audio, WiFi, and Zigbee integration. SilverPAC’s SilverSTAT has a 7 inch capacitive LED touch screen, running an embedded version of Windows CE 6.0, Wifi, USB 2.0 support, ZigBee, and Z-Wave. 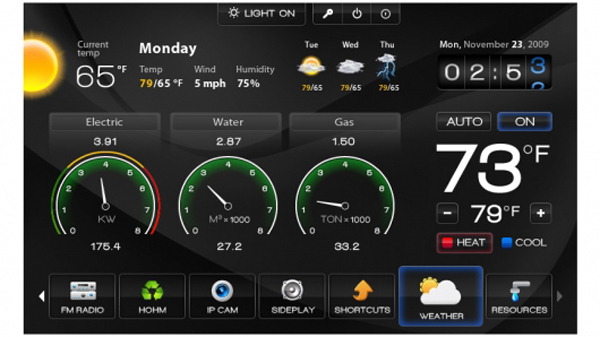 Posted in Architecture, Seen at the house, Technology and tagged Atom Computer, Home Dashboard Concept, Intel, SilverPAC, SilverSTAT 7, Windows CE on February 4, 2010 by Author.